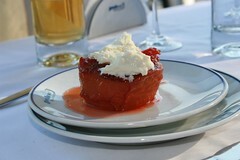 Last night, M. and I enjoyed the most luscious of Turkish desserts, Ayva tatlısı or quince sweet. And it was a welcome change to our diet of take out food – none of which has included dessert. Much to my surprise, the last few weeks have involved the consumption of takeout food. The Karagoz puppets, along with M’Lady, M. and the dog, have STILL been totally wiped out from the series of ongoing health challenges M’Lady is facing. In the face of all the takeout boxes, Kenne, (the queen of etiquette and maintenance of ladylike behavior puppet) has even given up on encouraging me to cook, instead focusing on the etiquette of how to deal with delivery people. She is basing her teachings on Miss Manner’s Guide to Saving Modern Civilization, an updated version of the original etiquette guide. So, given all the focus on takeout and the eating of cereal, one might imagine my surprise when M. walked in the door with a bag of lemons, a box of sugar and four quinces. 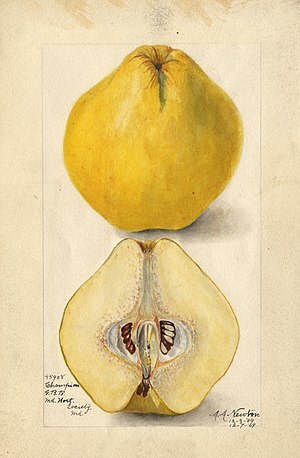 Quince, in case you don’t know, is “ayva” in Turkish, and looks like an odd-shaped, bumpy yellow pear. As M. barreled into the kitchen, he announced, with glee, that he was going to cook Ayva tatlısı. While directly translated as something along the lines of “quince sweet,” this dish is really a poached, spiced quince. For YEARS, M. has explained how much he loves this dish, dreamt of this dish in quince season and lamented not being in Turkey at the right time to consume as much Ayva tatlısı as possible. Dropping the bag on the kitchen counter, M. began to work in a frenzy, opening drawers with abandon, like a confused whirling dervish unsure of his new surroundings. I followed along in shock. Looking into the china drawer, he yelled “where’s the cinnamon, I need it!” I suggested looking in the spice cabinet. “What about a cooking spoon?”Giggling, I pointed to the utensil drawer. And it went on like this for a bit. Mercan Bey, the Arabian Spice Trader Puppet looked on in shock and a bit of woe, as he realized that M. did not know the kitchen so well. “I have made such an effort,” Mercan Bey said glumly, “to stock this kitchen with every Turkish spice imagineable…and he doesn’t even know where they are” While an amazing cook during our courtship, M. rarely cooks now despite his significant skill. To his credit, he does just about EVERYTHING else in the house, so who is to complain? Nodding his head, Mercan Bey agreed. It is rare to see a Turkish man vacuum, clean the bathroom and do the shopping…all of which he has done since I am sick. After securing all of his ingredients in a precarious perch on the counter, he dashed to his desk, calling up a Turkish-language recipe for the dish he has threatened to make for the last nine years but never seem to find the time. This is “the dish that got away” during our courtship. Zenne, the Nervous Nellie like a Dish of Quince Jelly Puppet suggested with hands on her cheeks “Perhaps you are on to a new phase in your courtship?” I smiled, as we are reaching the point of 10 years together. Ayva tatlısı or quince sweet a la M.
You will need: 4 Quinces (peeled, halved and cored, with all seeds, peels and detritus reserved); 1 Cinnamon stick (preferably the soft and crumbly Cassia version); a few cloves; 1.5 drinking glasses of water; 2 drinking glasses of sugar. 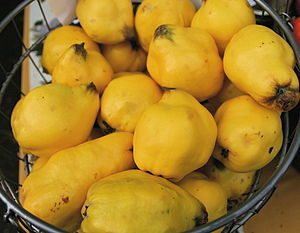 As you peel and core each quince half, place them in lemon-infused cold water. They may float, it’s ok.
Bring the pot to a boil on medium heat, then add sugar, and cook on low, for an hour and a half or more, until the quince halves begin to turn pink. You must watch the stove the whole time. Place on a dish with quince syrup from what is remaining in the pot – garnish with kaymak and crumbled toasted walnut and proclaim “AFIYET OLSUN!” (bon appetit) with glee! This entry was posted in Gendered moments, Turkish Food!, Visits from the Karagöz puppets and tagged Ayva tatlısı, Fruit, Quince, Recipe, Turkey, Turkish cooking, Turkish food, Turkish fruit. Bookmark the permalink. Finding common ground in our shared love of the quince…check out this very home-style recipe for ayva tatlisi! Sounds delicious, m’dear, and such a delightful evening for you both! Hi. As far as I understand, you are outside of Turkey. Where do you get your kaymak? Or do you use a substitute? Yes, we are mostly out of Turkey. We live near a kaymak producer (thank goodness!). I’m not sure there IS a substitute! Clotted cream seems a bit different….what about you, how do you handle the dearth of kaymak? Ah! Mascarpone. Never thought of that – would be a good fix. THANKS!